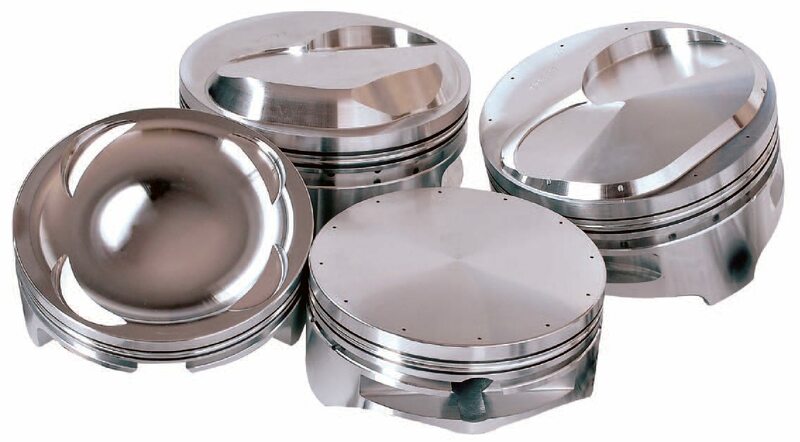 Racing pistons are manufactured from aluminum forgings. Certainly plenty of racing occurs with cast and hypereutectic pistons, but only where class rules forbid aluminum forgings. 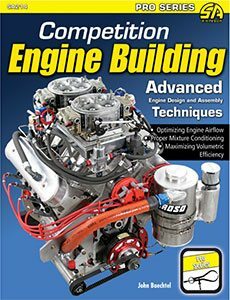 This book deals with high-level racing engines, so this discussion primar­ily pertains to forged racing pistons. With the exception of clearances and certain performance features, cast and hypereutectic pistons can be prepped the same way, so much of what is dis­cussed here still applies. With a fixed block deck height and stroke length, the rod length becomes the variable that dictates the pin height dimension and thus the relative location of the ring pack. Piston designers target specific ring locations according to the application, hence rod length must often be adjusted to achieve the best balance between ring placement, pin height, and the performance benefits of a specific rod length. The primary aluminum alloy for piston forgings is 2618 although 4032 is often used when greater control of thermal expansion is required (see “Piston Alloys” on page 59). The downside is a reduction in strength due to higher silicon con­tent. 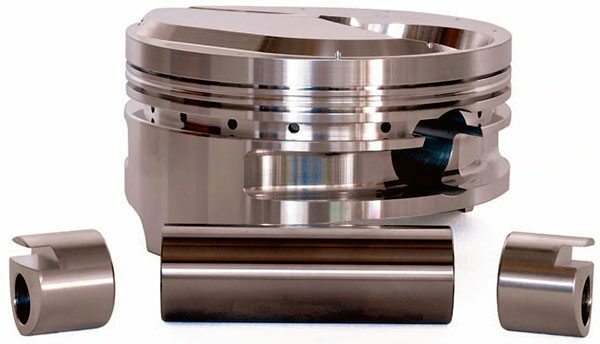 Choosing a piston for a racing engine requires careful evaluation of the final application in terms of engine speed and the sustained pis­ton motion, velocity, and loading that occurs. Hence a brief discussion of piston speed is warranted. Piston speed (velocity) refers to the average or mean speed of the pis­ton as it moves up and down in the cylinder bore during each crankshaft revolution. Since the piston actually comes to a complete stop at the top of the stroke (TDC) and at the bot­tom of the stroke (BDC), its speed and acceleration at any given point is always changing. The piston is always accelerating from or deceler­ating to zero speed. 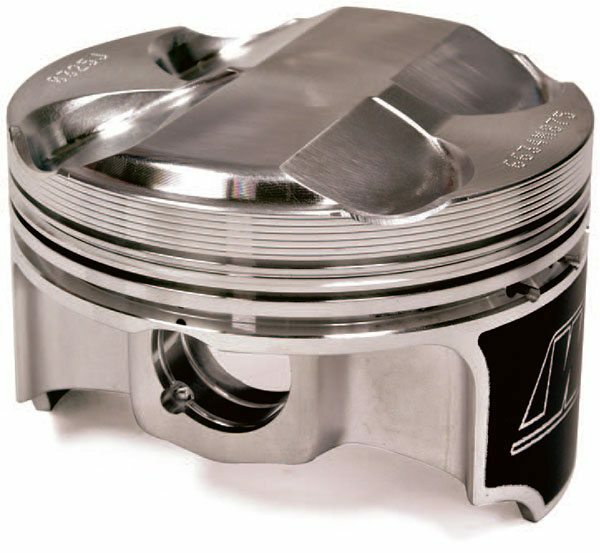 Accepted mean velocity for most racing pistons is about 4,500 fpm, but many racing engines routinely exceed that with mean speeds of 5,500 fpm or higher. Interestingly, many Formula 1 engines with an engine speed of 18,000 rpm typically have a mean piston speed below 5,000 fpm primarily due to their very short stroke. In contrast a Cup engine exceeding 9,000 rpm may have a pis­ton speed approaching 5,500 fpm. Mean piston speed has long been used as a predictor of component durability under severe service. 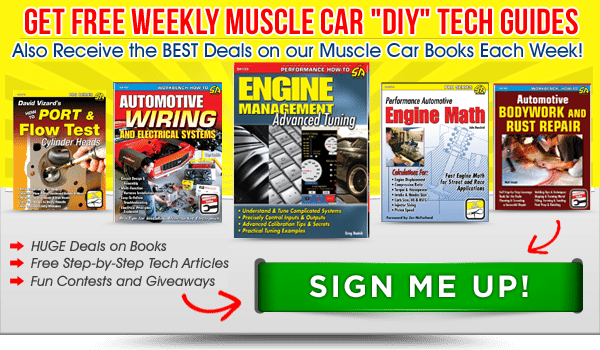 It is a good rule of thumb and it is even more instructive if you calculate maximum piston speed (MPS), since one of the axioms of engine perfor­mance dictates that power comes from engine speed. The more power strokes per minute, the more power available to do work. Multiply the stroke times pi and divide by 12 to get feet per revolu­tion. Then multiply by the maximum engine speed to get the maximum feet per minute. This speed occurs about mid stroke where the connecting rod is 90 degrees to the crankpin and the crank angle is approximately 75 degrees. Before that point the pis­ton is accelerating; after it the pis­ton is decelerating. When the piston is exactly at either TDC or BDC it is stopped and there is no acceleration. Continuing our example of a 350 Chevy with a 3.48-inch stroke, let’s find its maximum piston speed at 7,000 rpm. One of the most important con­siderations is the instantaneous pis­ton acceleration and the staggering loads placed on the piston pin bore, piston pin, connecting rod, and rod bolts when the piston reverses at TDC. These are the most highly stressed components in the engine. Since an engine’s ability to make power is closely tied to the RPM it can turn, every effort is made to lighten valvetrain components to combat valve float. But the real limit often turns out to be piston mass and piston acceleration. A typical 350 Chevy piston weighs 1.3 to 1.6 pounds. 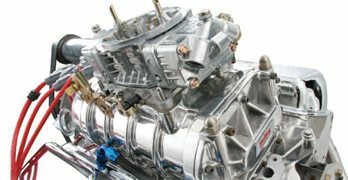 Special racing pistons weigh less, but imag­ine trying to accelerate one to over 6,800 fpm (350 Chevy at 7,500 rpm) maximum piston speed at mid-stroke and then slam it to a dead stop and reverse direction in about 1¾ inches (stroke ÷ 2). At TDC the piston is headed for the moon and the rod has to stop it and yank it back the other way. That’s enough to pull the piston pin right out of the piston, and it does on occasion. It also exerts similar loads on the rod bolts and rod cap. Accel­eration (and thus g-force) is greatest just after TDC on the exhaust stroke (because there is no compression to cushion the piston). 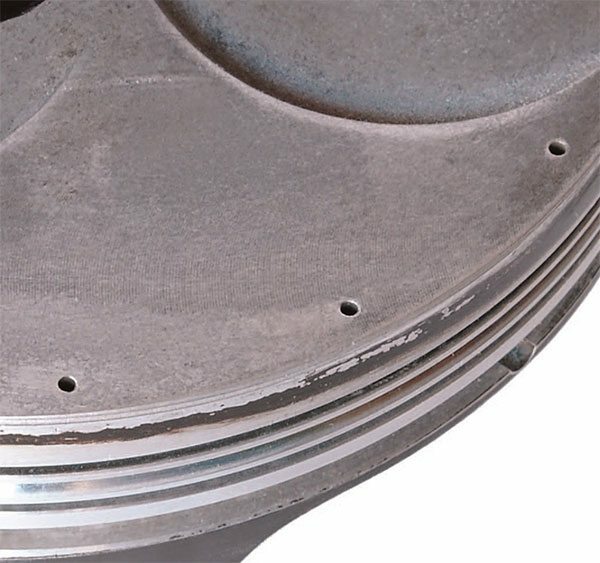 With the advent of shallower combus¬tion chambers, flat-top pistons are often a favored choice among engine builders seeking higher compression ratios and optimum flame travel. That’s insane acceleration for a 450- to 600-gram object that is not a cannon projectile. Because they are captured by the ring grooves, the pis­ton rings are along for the ride, slam­ming up and down within the ring grooves trying desperately to main­tain a seal with the cylinder wall. Is it any wonder that they experience ring flutter at very high engine speeds? Hence, the practice of using the tight­est ring grooves possible without sei­zure and the thinnest and lightest rings that have minimal inertia. If you apply this math to a For­mula 1 engine you’ll find that the instantaneous acceleration is far beyond the normally accepted limit of 150,000 ft/sec2. How do they do it? The pistons are changing direction more than 150 times per second. It seems far beyond the physical limita­tion of the components involved, but then Formula 1 uses some very light and very strong exotic materials. As discussed earlier, piston speed is an issue for component durability as it relates to engine speed and g-load­ing. But there is another factor of near equal importance. Note that even NASCAR and Formula 1 engines don’t like to exceed an MPS of 5,000 feet per minute. The reason is oil control. 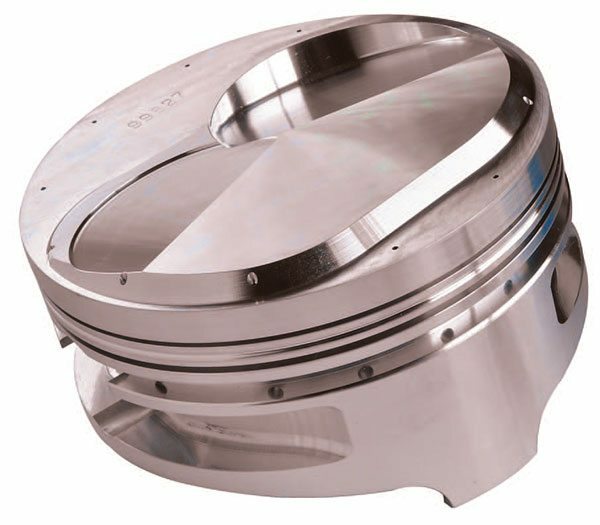 Basic piston top choices include flat tops, dished, and various domed shapes designed to increase the com¬pression ratio. 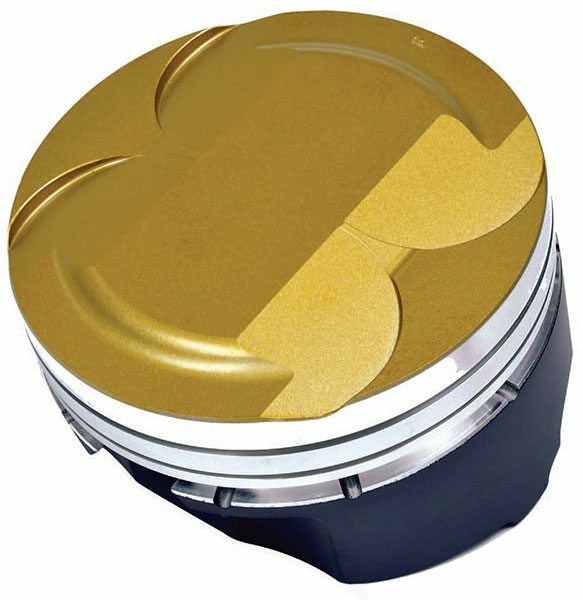 An exception to the flat-top revolution is this Honda S2000 piston designed for a pent-roof combustion chamber in the Honda four-valve-per-cylinder head. In most engines, the pistons and rings are lubricated by oil splash being thrown off the spinning crank and rods. NASCAR and Formula 1 engines have an additional source provided by pin oilers, which spray a small jet of oil at the bottom of the piston to lubricate the piston pin and cool the piston crown. But most engines rely only on splash. This becomes a potential problem when you dry sump an engine to remove all oil from the pan. In many cases efforts are also made to isolate the cam tunnel to eliminate cam and lifter oil from dripping on the crank­shaft. All of these things combine to reduce the amount of oil being splashed on the cylinder walls. Why is this important? 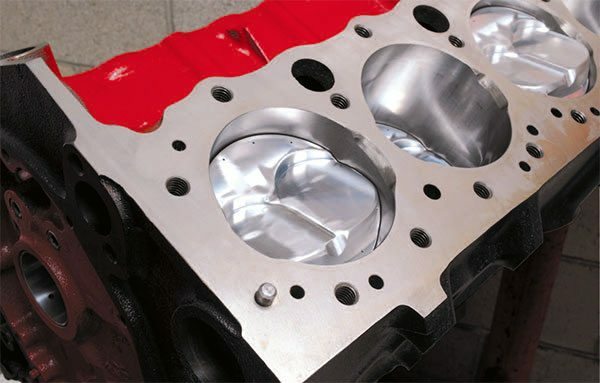 At elevated engine RPM and the attending high piston speeds, reduced cylinder oiling makes it difficult to maintain a consistent hydrodynamic oil film between the piston and the cylinder wall. When MPS exceeds 5,500 rpm, inconsistent lubrication causes the piston to scuff and, worst-case scenario, friction-weld itself to the cylinder wall. This typically results in cylinder wall scor­ing and ultimately engine failure. 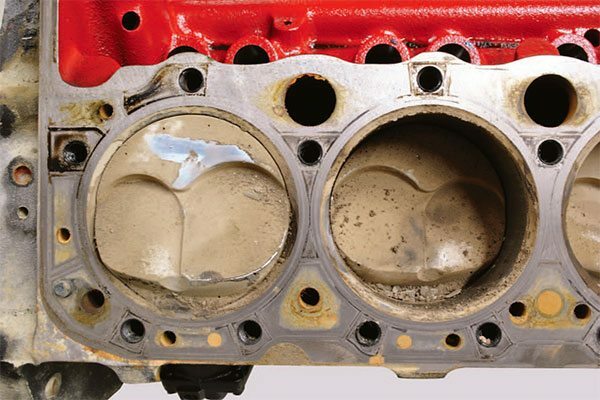 The greater the piston speed, the big­ger this problem can be, especially when other oiling system modifica­tions combine to reduce cylinder wall oiling. When piston speed is too high, the minimal fog of lubricant in the crankcase has no time to attach itself to the cylinder wall. Piston selection incorporates numerous factors including alloy type, expansion characteristics, skirt design, deck and dome configura­tion, pin type, and ring design and placement. Virtually all pistons are made from either 2618 or 4032 alumi­num. These alloys differ primarily in their material content and ther­mal and fatigue properties, which dictate their suitability for differ­ent applications. A 2618 piston has almost no silicon content. 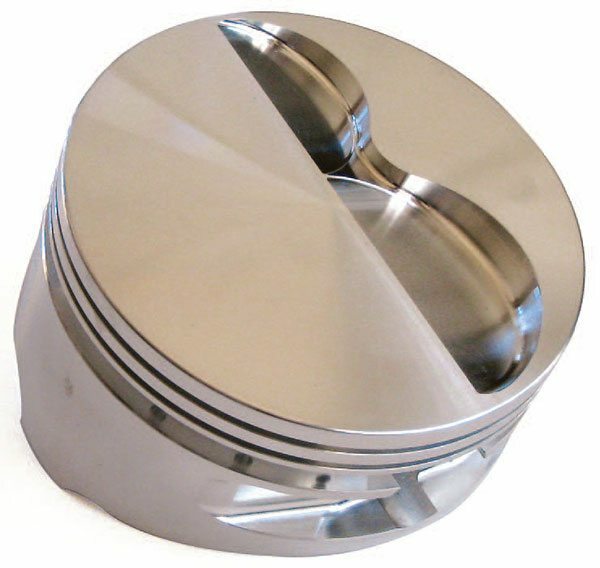 It expands approximately 15 percent more than a piston manufactured from 4032 alloy, but it yields higher strength at racing temperatures, particularly above 500 degrees F. Therefore, more race pistons are manufactured from 2618 than from 4032, which is more popular for street engines that uti­lize less cold clearance and require minimal startup noise. 2618 is the material of choice for Cup engines, Formula 1, and most high-end appli­cations. Unless piston choice is lim­ited to cast or hypereutectic pistons, the application will almost certainly be machined from one of the various proprietary 2618 forgings utilized by the major piston manufacturers. 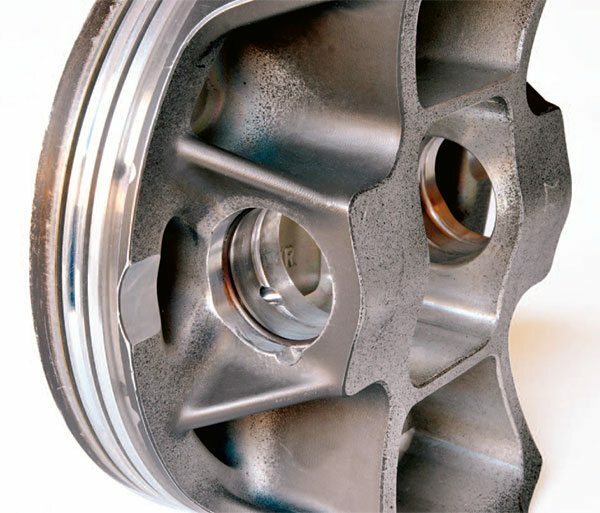 2618 alloy expands roughly 15 percent more than 4032 alloy, hence its initial piston-to-wall clearance is 15 percent greater. Both alloys have approximately the same clearance at operating temperature with 2618 expanding approximately a half a thousandth (.0005-inch) more at 375 degrees F on a 4-inch-diameter pis­ton. Pistons made from 4032 alloy are typically used for street/strip applications while most race applica­tions use 2618 alloy for its superior tensile strength, fatigue resistance, and lower modulus of elasticity. 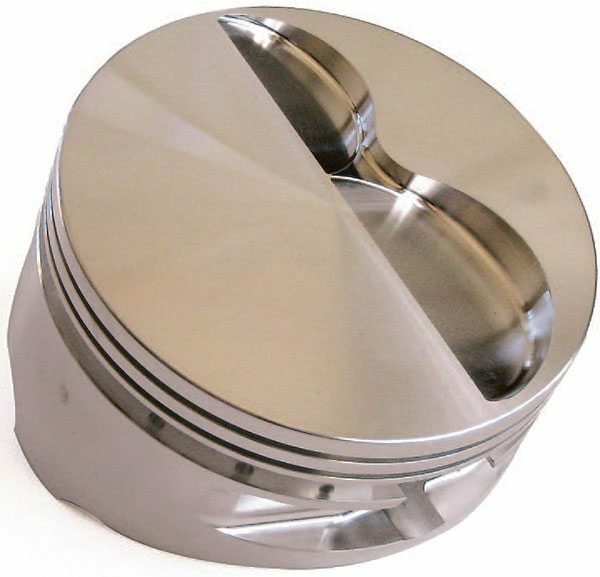 Choice of piston top configu­ration is application specific and dependent on the compression ratio and combustion chamber configu­ration. High compression is still a staple of engine efficiency and big horsepower, but contemporary rac­ing engines achieve it in different ways. In many cases large piston domes no longer prevail. Flat-top pistons and some gentle dome con­figurations are much more preva­lent. They are designed specifically to work with modern cylinder heads that have shallower, highly efficient combustion chambers. These combinations can still achieve high compression ratios and they are much more efficient due to improved mixture motion and com­bustion characteristics. Also, smaller combustion chambers help to build static compression and they generally provide shorter flame travel, which lessens the initial timing requirement and reduces negative work against the piston as it approaches TDC. Piston skirts stabilize the piston in the bore. If the ring pack alone were capable of maintaining stability and optimum ring seal throughout all the various direction and pressure changes and the overall range of engine speed, you could remove the skirts altogether and eliminate a major friction source. Unfortunately that’s not possible, particularly with the current trend to lower tension rings. Skirts are necessary to provide stability to the piston’s secondary motion, which is rocking in the bore caused by thrust loading, fric­tion characteristics, piston center-of-gravity, pin location, and offset and temperature variations. The piston designer’s goal is to optimize stabil­ity and minimize frictional losses at the same time. This is accomplished by optimizing the skirt contact area based on the application. Shorten­ing the skirt length reduces friction, but it may also tend to compromise stability. More effort is generally expended in shaping the surface con­tact area to minimize friction while maintaining stability. Most pistons still incorporate a cam grind or elliptical shape to the skirt area as a means of controlling contact area. The same goes for the barrel profile, which also influences contact area. The barrel shape tapers inward, reducing the piston’s diam­eter as it approaches the bottom of the oil ring groove. This reduces the amount of skirt material exposed to cylinder wall contact. Critical factors are oil film viscosity, the thickness of the oil film, the degree of cylin­der wall lubrication brought about by the engine’s particular crankcase and rotating assembly characteris­tics, and the presence or absence of pin oilers. Modern race pistons typically employ inboard pin bosses to shorten and stiffen the piston pin and to reduce weight. Depending on the applica¬tion different types of skirt struts are used to add strength and stability to the piston. All of this is dependent on the engine speed range, stroke length, and rod angularity. Piston salesmen are well versed in the latest trends and procedures so don’t fool yourself into thinking you know more than they do. Quite likely, you don’t, but it’s a shared experience. Piston sales­men and designers are constantly evaluating feedback from racers to accumulate an enormous body of knowledge that covers a broad spec­trum of applications. Piston-to-wall clearance at the skirt is normally measured at the gauge point 1/2 inch up from the bottom of the skirt, but some manu­facturers have very specific measure­ment points that you should use if they are provided. To some degree the clearance needs to be greater on larger cyl­inder bores to allow for increased expansion on larger pistons. Because of their greater thermal expansion characteristics, 2618 pistons require more clearance than 4032 pistons. The rule of thumb is approximately .0012 inch per inch of bore diameter. Many applications require addi­tional clearance to accommodate extreme pressure and thermal loads and/or extreme engine speed. These are arbitrary guidelines and you should always determine the opti­mum clearance by consulting with a piston salesman and machinist. 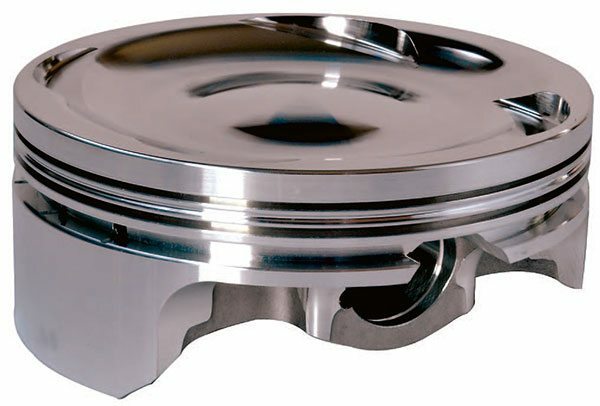 The deck clearance is defined as the distance between the piston top and the deck surface of the cylinder block when the piston is stopped at TDC. 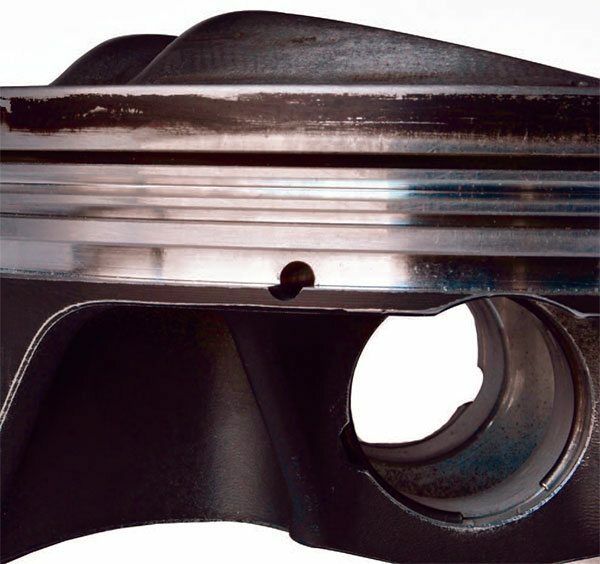 Deck clearance is one compo­nent of the piston-to-head clearance dimension that seeks to accomplish the minimal clearance possible with­out sustained piston-to-cylinder head contact. 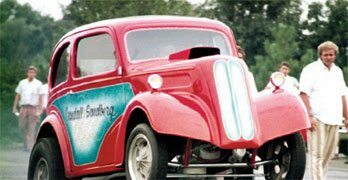 The purpose is to pro­mote maximum quench effect (or squish) in a wedge-type chamber that physically forces the fuel mixture closer to the spark plug, where it is more prone to combust properly. The resulting turbu­lence enhances mixture qual­ity and frequently permits a reduction in spark timing to reduce negative work against the piston prior to TDC. Power is typically increased and brake-specific fuel consumption is improved with less chance of detonation. Contact reduction grooves are machined into the top ring land. They minimize piston-to-wall contact on pis¬ton rock-over. The accumulator groove is machined between the top and second ring grooves. It helps relieve excess combustion pressure below the top ring, which can unseat the ring. This diagram illustrates all the important features and dimensions of a typical racing piston. Note in particular the valve angle and pin height or compression height, which varies according to rod length. Accurate deck height measurement is essen¬tial for computing the compression ratio. With or without a ring installed during mockup, the best location to check deck height is near the edge of the piston along the pin axis. This eliminates any effect from piston rocking. Deck clearance can be manipu­lated by altering the piston pin loca­tion relative to the fixed rod and stroke dimensions or by selective piston top machining in some cases. Many times, off-the-shelf pistons from major manufacturers can be used with considerable comfort as they incorporate common compres­sion height dimensions that are usu­ally compatible with available block deck height dimensions. Many builders take a minimum cut off the block deck surface to square it with the crank centerline and then order custom pistons with pin placement specifically positioned to accommodate the piston-to-head clearance they intend to achieve with the proper combination of deck height and gasket thickness. Choosing a pin location involves considerably more than simply fit­ting the whole reciprocating pack­age into the available space. The position of the wrist pin in the pis­ton must accommodate many criti­cal dimensions. Most racing engines use longer than stock connecting rods, which help reduce piston weight while having positive effects on torque positioning and combus­tion efficiency. The higher the pin position, the shorter the piston and there is a resulting reduction in pis­ton mass. This frequently requires the ring pack to be located higher on the piston. In naturally aspirated applica­tions, builders appreciate this because they like to move the ring pack to lighten the reciprocating assembly, improve piston stability, and mini­mize unburned gases in the crevice volume above the top ring. 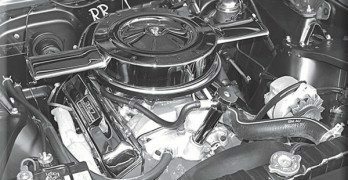 However, longer rods in a supercharged appli­cation are often more problematic because boosted applications need to move the ring pack down the piston to position it farther from excessive heat. Longer rods make this diffi­cult to accomplish. In many cases a shorter rod can be specified for boosted applications because boost pressure reduces the need for the critical rod/stroke tuning relation­ships required for efficient naturally aspirated operation. Extra-tall domed pistons are still required for certain applications with large combustion chambers in order to achieve higher compression ratios. These pistons require close attention to detail regarding valve-to-piston clear¬ance, valve shrouding, and a generous fire slot to ensure efficient flame travel. When long rods force the pin higher in the piston they require careful checking for interference between the top of the rod and the underside of the piston top. You need a minimum of .050-inch clear­ance between the rod and the piston at this point. In many cases the pin bore also interferes with the oil ring groove and a support rail must be added to stabilize the oil ring. 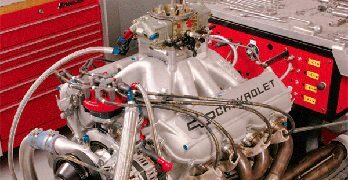 There is a practical limit to how high the ring pack can be moved, typically no closer to the top than .200 inch, although many short-duration drag racing engines run it higher. 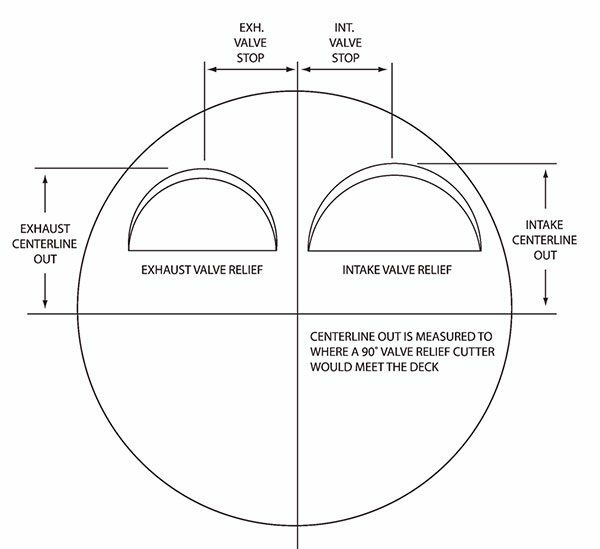 One important factor is the depth and location of the valve relief pockets relative to the proximity and depth of the top ring groove. This presents a potential structural weakness at the closest point and higher potential for burn-through or irreparable damage from detonation. All major piston manufacturers are very familiar with these requirements and salesmen nor­mally keep customers out of trouble even though many may wish to go there. In many cases they can select an alternate forging and machine it to accommodate your requirements. If, in the case of naturally aspirated applications, you are using rod length to help position a torque curve, the sales people can get you as close as possible to your desired dimensions while making sure you don’t exceed limits that lead to early failures. 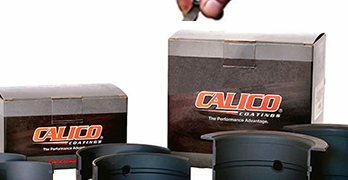 Piston coatings are now com­monplace. Several types are used on pistons depending on the desired results. Various thermal barrier coat­ings are frequently applied to piston tops. They help hold heat in the com­bustion chamber to increase cylinder pressure while reducing the amount of heat transfered into the piston. Benefits also include reduced oil tem­perature and piston expansion. These grooves are designed to limit piston-to-cylinder-wall contact at elevated temperatures and high RPM. They are machined into the top ring land to protect the top ring by theoretically disrupting detona­tion pressure waves. Engine builders are split regarding their value, par­ticularly since many pistons already incorporate a small degree of vertical taper on the top ring land to guard against contact between the piston and cylinder wall. The general con­sensus is that they don’t add power and that once detonation occurs, ring seal is lost and bigger problems usually ensue. A V-shaped or U-shaped groove is machined into the second ring land to collect excess blow-by between the top and second ring. This groove collects excess residual combustion gases to help control top ring flutter while maintaining ring seal. Piston skirt cam shapes are gen­erally divided into two types: high-cam and low-cam profiles. Both are slightly elliptical but the high-cam shape is more pronounced. Both styles produce similar fictional losses, but the high-cam profile permits tighter cold-piston-to-wall clearances. Both cam profiles tend to resume their round shape once they come up to temperature. 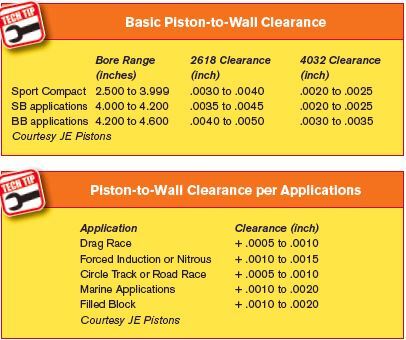 A piston sales rep can help you decide which is best for your application. In addition to a barrel shape or taper below the oil ring groove, pis­tons also taper inward above the oil ring to accommodate thermal expan­sion and prevent piston-to-wall con­tact upon piston rock. The difference in diameter of the top ring land compared to that of the oil ring land often is .025 to .040 inch. Vertical gas ports are a series (8 to 12) of vertical holes drilled around the perimeter of the piston deck at a radius that coincides with the back of the top piston ring groove. These holes direct combustion gas pressure to the back side of the top compres­sion ring to force the ring out against the cylinder wall for improved seal­ing. These ports are typically used for short-duration drag racing applica­tions and are designed to work with a tight ring groove side clearance of about 0.001 inch. Lateral gas ports perform the same function as vertical gas ports except they are half-round slots drilled horizontally into the top ring land at the top of the ring groove. Like vertical gas ports, they are essen­tial for sealing low-tension compres­sion rings. Lateral gas ports are more commonly used in longer-duration and endurance circle track and road racing applications. 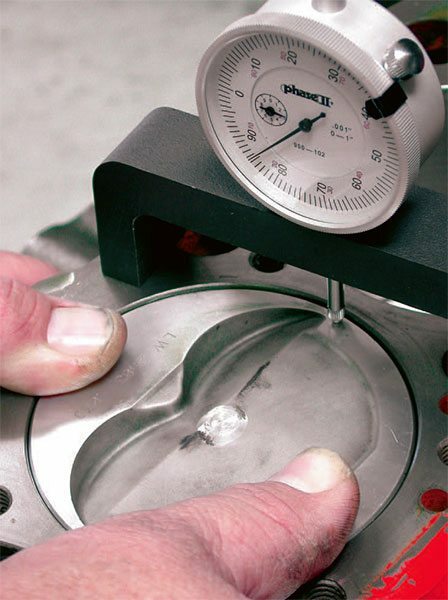 They offer simi­lar ring sealing ability, but tend to acquire less carbon buildup than the vertical ports over time. 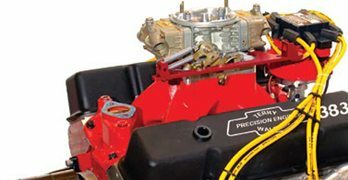 Piston-to-valve clearance is one of the most critical clearances in a rac­ing engine. The intake valve comes closest to the piston at approximately 10 degrees ATDC and the exhaust valve is closest at about 10 degrees BTDC. 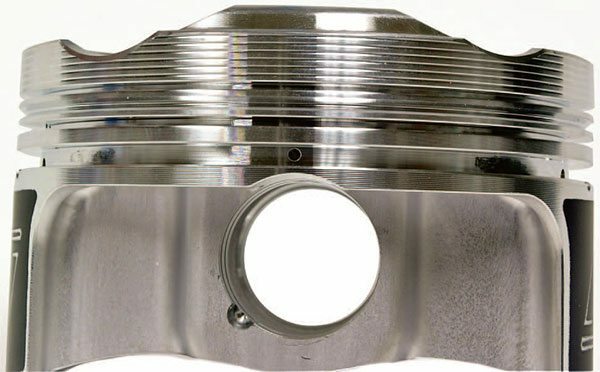 Many racing pistons are now manufactured with valve reliefs that already incorporate the correct valve angle and accommodate the neces­sary depth, but you must check every single one of them personally, partic­ularly if you are practicing individual cylinder tuning via different cam profiles and/or rocker ratio in alter­nate cylinders. Minimum clearance should be .100 inch on the intake valve and .120 inch on the exhaust valve and this should be increased by .020 to .030 inch if you run aluminum rods. Engine builders frequently fudge this a bit, but it is a dangerous course. The radial clearance on each valve should be at least .050 inch and the valve relief pocket must be machined at the proper angle and perfectly per­pendicular to the valve axis. JE Piston’s asymmetrical pis­tons have gained favor with many import engine builders. A recent development pioneered by JE, asym­metrical pistons, are manufactured with smaller, narrower skirts on the minor-thrust side. This configuration retains the standard design intent skirt for the major-thrust surface as required by the specific application. The skirt on the minor-thrust side is reduced in size (width) to help minimize friction while still sup­porting piston stability within the bore. This also reduces overall piston weight. To date this piston design is only being applied in import engines with smaller, lighter pistons. Some engine builders like to push the valve-to-piston clearance pretty tight, but there are guidelines that most builders use to keep themselves out of trouble. For steel and titanium rods with minimal stretch, .060 to .080 inch is the generally accepted minimum clearance. 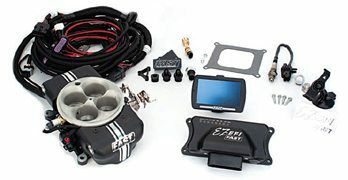 To some degree this also depends on the camshaft and valvetrain and the engine’s operational speed range. With lower engine speeds, some builders may fudge the intake clearance a little below .060 inch while maintaining the exhaust valve clearance at .100 to .120 inch. Two times the intake clearance is the generally accepted rule of thumb. Higher-speed engines require even more precise fitment to ensure safe operation. This is particularly important in order to provide a safety factor in case of missed shifts or other conditions where an over-rev may occur. The intake valve comes closest to hitting the piston at approximately 10 degrees ATDC and the exhaust valve comes clos­est at about 10 degrees BTDC. Note that from this point the intake valve is actually chasing the piston down the bore as it opens, thus from the closest point, the clearance is always increasing. 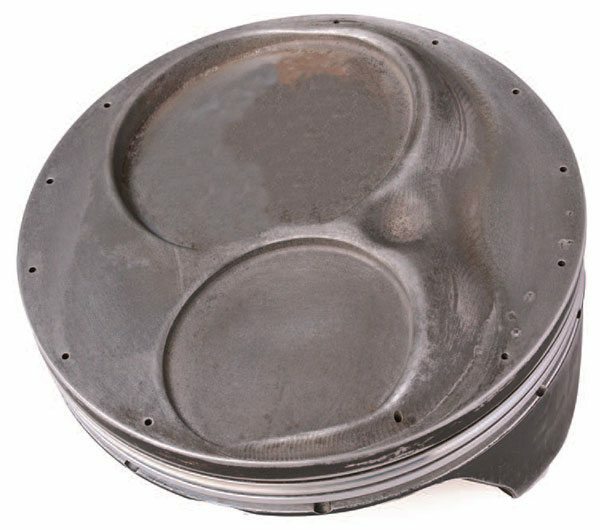 Flat-top pistons have become much more prevalent because they mini¬mize the loss of combustion heat to the surface area. They also promote superior flame travel when paired with shallow combustion chambers. High-performance dished pistons are desirable in supercharged and turbo¬charged applications where the static compression ratio must be limited to ensure a safe and effective compres¬sion ratio under boosted conditions. Theoretically the intake valve should never hit the piston as long as you have adequate clearance at this point. 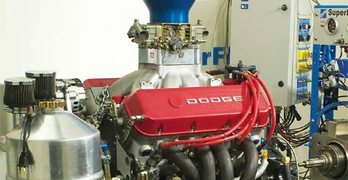 While not good for power pro­duction, some small degree of push­rod and rocker arm flex at this point actually works in your favor in terms of valve-to-piston clearance. On the exhaust side the piston is bearing down on the exhaust valve as it closes. It is imperative that con­tact be avoided at all cost. Additional exhaust valve clearance is required to accommodate thermal growth of the valve due to high exhaust tem­peratures. It is also important that the valve reliefs in the pistons are geometrically parallel with the faces of the valves. This can sometimes minimize damage if slight contact does occur. The radial valve relief clearance around each valve should be no less than .050 to .060 inch. 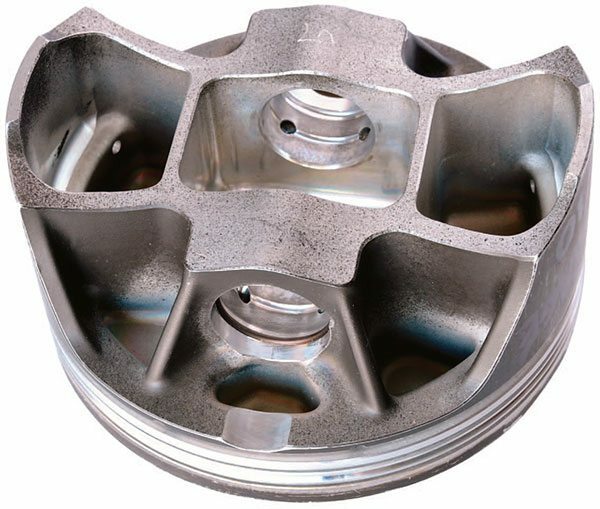 Exhaust valve piston-to-valve contact is typically exacerbated by high engine speeds where the valvesprings have trouble keeping the lifters in contact with the cam lobes, causing some degree of lofting or float. Loss of lifter con­trol frequently causes exhaust-valve-to-piston collisions due to thermal lengthening of the valve and the more critical dynamic relationship of the piston chasing the valve as it closes (see Chapter 11). Understanding the many factors of race piston design is fundamental to making the correct choices to suit the intended racing application. These are grooves machined into the top ring land to protect the top ring by theoretically disrupting detonation pressure waves. They are designed to limit piston-to-cylinder-wall contact at elevated tempera­tures and high RPM. Engine builders are split regarding their value, par­ticularly since many pistons already incorporated a small degree of verti­cal taper on the top ring land to guard against this contact. The general con­sensus is that they don’t add power and that once detonation occurs, ring seal is lost and bigger problems usually ensue. Contoured piston tops cut specifically to match a known combustion cham¬ber shape and size are commonly used in specific racing applications. Manufacturers such as Ross Pistons can digitize your chambers for an exact match. This is a V- or U-shaped groove machined into the second ring land to collect excess blow-by between the top and second ring. This groove collects excess residual combustion gases to help control top ring flutter while maintaining ring seal. This close-up of a typical gas port arrangement illustrates size and placement of vertical gas port holes drilled to direct combustion pressure to the back side of the top compres¬sion ring. Gas ports are beneficial when using low-tension rings with reduced radial width. They use com¬bustion pressure to provide superior ring seal on the combustion stroke while providing reduced friction on the other strokes. 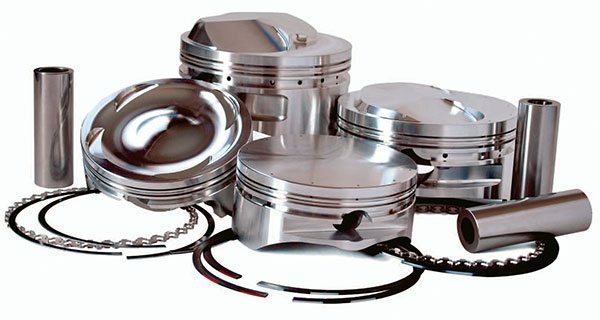 Every piston requires the cor­rect cam and barrel skirt shape for the application and the anticipated engine speed. Different cam and barrel profiles are utilized for maximum per­formance. Piston manufacturers have a range of cam and barrel profiles that apply depending on the specific forg­ing and the final application. When the skirt shape has been optimized it promotes tighter clearances, greater stability, improved ring seal, increased power, and improved durability. Advanced piston coatings have be¬come the norm in many racing circles. This piston features a thermal heat barrier on the crown and a friction-reduction coating on the skirts. These views of a modified Dodge Cup piston show vertical gas ports, precisely shaped dome and valve reliefs, and care¬ful blending of all sharp edges. Note the combustion residue above the top ring, but none below it. The left view shows the forced pin oiling slot inside the pin bore. 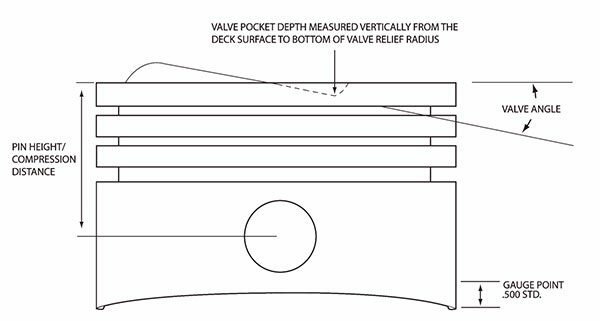 Vertical gas ports are a series (8 to 12) of vertical holes drilled around the perimeter of the piston deck at a radius that coincides with the back of the top piston ring groove. These holes direct combustion gas pressure to the back side of the top compres­sion ring to force the ring out against the cylinder wall for improved seal­ing. These ports are typically used for short-duration drag racing applica­tions and are designed to work with a tight ring groove side clearance of about .001 inch. These ports are meant to perform the same function as vertical gas ports except they are half-round slots drilled horizontally into the top ring land at the top of the ring groove. Like vertical gas ports, the intent is to enhance the sealing of low-tension rings. Lateral gas ports are more com­monly used in longer duration and endurance circle track and road rac­ing applications. They do not offer the same ring sealing ability as verti­cal ports and they tend to negatively affect top ring sealing unless every­thing is perfectly aligned. Piston rings have one of the tough­est jobs in a competition engine. They are subjected to various conflicting forces while constantly being slammed back and forth up to 150 times per sec­ond or more. Consider for a moment the primary goals of the piston rings in a modern racing engine. These are formidable goals for thin metal rings that are subjected to the massive forces of combustion. To better understand the ring’s func­tion, let’s examine each ring in the cylinder kit separately. The top ring’s sole function is to maintain the compression ratio and seal the combustion space against many thousands of pounds of com­bustion pressure upon ignition. This is a formidable task. The ring is required to maintain bi-directional sealing under all conditions even as it is subjected to the rapid high pressure rise of normal combustion, which then dissipates quickly as pres­sure is applied to the piston during the expansion cycle (power stroke). Comparatively speaking, the top ring gets a bit of a breather during the exhaust and intake strokes, but it still has to maintain its seal while subjected to rapidly varying changes in pressure, direction, and velocity. 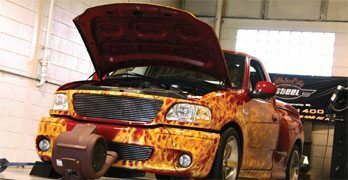 It has to hold compression on the compression stroke and then gets slammed back the other direction under maximum combustion pres­sure on the power stroke. Throughout all of this the piston is rocking and vibrating in the bore while crankshaft oscillations attempt to impart a jerking motion to ring travel to the point where the rings don’t know whether they are coming or going. And then the engine deto­nates and ring seal is totally lost. Top rings are subjected to mas­sive and near instantaneous forces just as they are attempting to change direction in a hostile environment of severe heat and pressure. Current trends toward thinner rings to reduce friction and resist ring flutter only exacerbate sealing problems; hence ring configuration and preparation are extremely critical. For years the traditional front-line application has been a high-strength ductile iron ring with a moly (molybdenum) inlaid face. Over time, this type of ring evolved to the current plasma moly facing that is sprayed onto the ring face at high temperature and velocity. This ring treatment is more resistant to the cracking and flaking that sometimes plagued inlaid rings under severe operating conditions. Plasma-coated rings are preferred for many high-performance applica­tions, but they are still susceptible to damage from high shock load conditions such as those found in nitrous-oxide and other power-adder applications. For these conditions, newer-style gas nitride ductile iron rings are usually a better choice. Gas nitriding is a specialized surface treat­ment used to harden the ring face for improved wear characteristics and resistance to detonation. 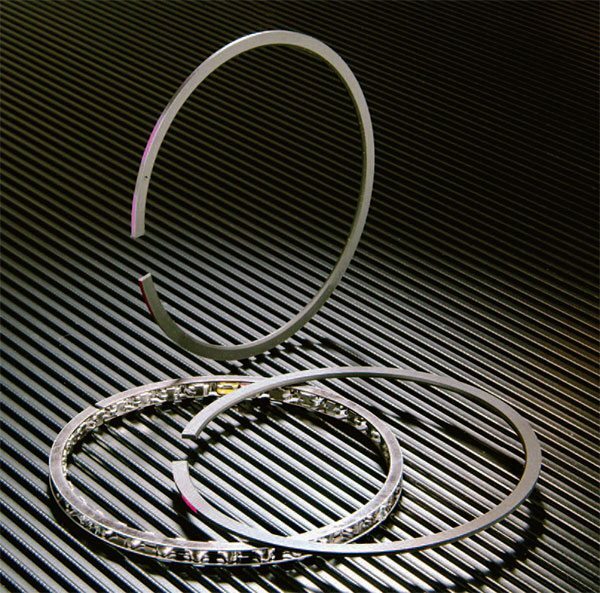 Gas nitride rings are superior in every respect and have even found favor in many OEM applications. Standard steel rings are also a good choice for power-adder applications where severe duty is anticipated. Racers in high-contamination environments such as dirt track or off-road racing often prefer chrome-faced top rings for their durability, but more recently many builders have switched to plasma-coated rings for their superior heat resistance under severe operating conditions. A new generation of thin vacuum-deposited chromium nitrite rings has rein­vigorated chrome ring applications and many OEMs have now adopted them for their excellent wear charac­teristics. The general trend in racing rings points to thinner steel or stain­less rings, many with exotic coat­ings such as tungsten or titanium nitride. These rings offer exceptional wear and sealing characteristics with enhanced friction reduction. Coatings are applied using a positive vapor deposition process that has proved to be reliable and substantially beneficial in terms of power and durability although still quite expensive for all but well-funded applications. If any single ring type seems to be losing favor it is probably the L-shaped Dykes, or headland, ring with a 1/16-inch face and a .017- or .031-inch step on the back side to provide gas pressuriza­tion without requiring gas ports on the pistons. Dykes rings require compatible piston ring grooves and they are gen­erally harder to seat. They also exhibit higher wear characteristics due to gas pressurization behind the ring. They are in limited use, such as blown fuel drag racing applications where they are resistant to high pressures and excessive fuel wash in the cylinders. Second compression rings are really misnamed since their primary function is to assist with oil control. Most ring manufacturers hold that the second ring is about 85 percent devoted to oil control and only 10 to 15 percent to compression seal­ing. Its main mission is to scrape oil missed by the oil ring to that it doesn’t find its way to the combustion chamber to contami­nate the fuel mixture. Since heat is not an issue with the second ring, a conventional cast-iron ring with a reverse bevel and tapered face is still employed with the primary task of scraping oil. Where the pin bore encroaches on the oil ring groove, most applica¬tions use an oil ring support rail with a shorter inboard pin. The alternative is to use pin buttons with machined ring grooves that serve as oil ring supports. The buttons control pin placement and ring support, and they are much easier to assemble than the standard Spirolox or Truarc rings. 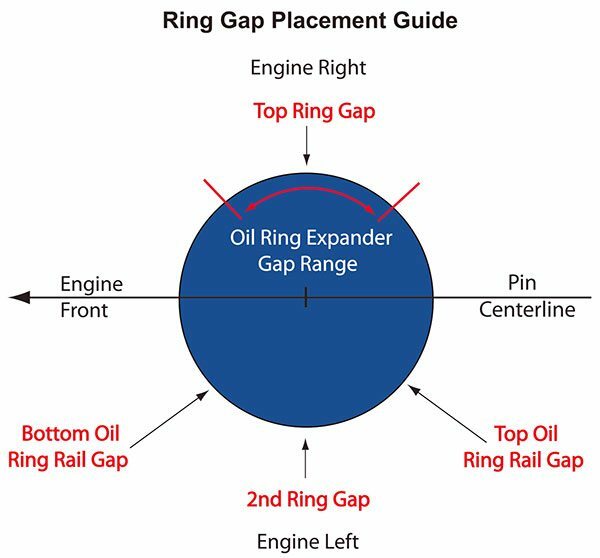 This ring gap placement guide is suitable for most racing applications. Note the specific placement according to the pin centerline and the front of the engine. A recent improvement is the Napier-style ring, which features a hook or claw shape on the back side that serves as a reservoir for oil being scraped off the cylinder walls. Napier-style rings have found favor in both OEM and racing applications because they provide exceptional oil control and reduced friction. They also permit builders to open the sec­ond ring gap wider to promote more effective pressure relief between the top and second ring, thus easing the top ring’s sealing effort. Most oil ring packages employ a three-piece unit with a primary expander ring supported by upper and lower scraper rails. Many of the performance gains associated with ring technology have come from oil ring weight and tension reduction. Low-tension oil rings have long been known to aid performance via fric­tion reduction, but recent improve­ments have realized additional gains. Ring tension is the primary focus of these efforts. Ring tension is mainly a function of the ring’s radial depth in the ring groove. For decades oil rings have maintained the SAE standard of .199 inch, but recent development has reduced radial depth to .150 inch or less. With the piston ring groove machined to a corresponding depth and appropriate clearance, tension is reduced because the thinner ring is more flexible. Basic racing ring applications typically incorporate a plasma moly compression ring and medium to low-tension oil ring. Conventional low-tension rings provide about 12 to 14 pounds of ten­sion and low-tension rings in OEM performance engines like the Modu­lar Ford or the GM LS series now oper­ate with less than 10 pounds of radial tension. They offer exceptional oil control in a production environment and superior frictional qualities that dramatically impact fuel economy. By way of comparison, the best high-end Sprint Cup ring sets use a 1.5- to 2.0- mm oil ring with only 2.5 to 4 pounds of radial tension. These professional racing rings, such as Perfect Circle’s U-Flex oil ring, are made in lim­ited sizes for Cup requirements and require very precise CNC ring groove machining and dry sump lubrica­tion supported by additional vacuum pump crankcase pressure evacuation to limit pressure below the rings. The following design elements apply to piston ring selection. The clearance between the ring axial height and the height of the piston ring groove. The vertical thickness or height of the piston ring in the axial direction. Clearance between the back or inside diameter of the ring and the back of the ring groove when the ring face is flush with the ring land. The clearance between the ends of the ring when compressed within the cylinder bore. The end gap clearance when the ring is not compressed. The inside diameter of the ring when compressed to the bore diameter. The outside diameter of the ring when compressed to the bore diameter. The width of the ring in the radial direction. The top and bottom surfaces of the ring. The front of the ring that con­tacts the cylinder wall. The installed position of the ring, which imparts cross sealing due to a chamfered area on either side of the ring. This configuration makes the top ring cone slightly upward and the second ring come slightly downward. Now let’s examine the currently favored techniques for piston ring preparation and installation. Savvy engine builders recognize the impor­tance of proper cylinder wall prepa­ration in terms of surface finish and efforts to control cylinder shape under load at operating temperature (see Chapter 3). Assuming optimum cylinder wall preparation for the pur­pose of this discussion, we can exam­ine the role and preparation of rings as it applies to a racing environment. Successful piston ring applica­tion begins with proper ring groove preparation. Because the ring seals on its face and against the ring land, precision-fit ring grooves are essential for proper piston ring operation. The tightest possible clearance between the ring and the ring groove is desirable for optimum ring control, but it is absolutely crit­ical that the ring not stick in the groove. Ring clearance is necessary to allow for component expansion and to allow gas pressure to migrate behind the ring. Many high-end builders prefer to purchase piston blanks and cut their own ring grooves to exacting specifi­cations. This is found at the highest level of competition, but it is primarily a function of habit and does not con­stitute a slam against ring grooves cut by any of the major piston manufac­turers, which also go to great lengths to cut very precise ring grooves. Piston ring micro-welding occurs when aluminum from the bottom of the top compression ring groove transfers to the bottom of the top compression ring, causing it to stick in the groove. This causes ring rotation to cease and typically results in increased blow-by as the ring loses bore conformity and tor­sional twist. The primary cause is usually poor ring groove finish or the ring not being exactly perpen­dicular to the piston. It is more fre­quently seen near the ring gap since this is a potentially greater source of hot gas leakage, which contributes to the problem. The condition is often exac­erbated by improper ring groove clearance (too tight) and may be pre­cipitated by excessive temperature, which affects the hardness of the piston material. Micro-welding typi­cally begins during engine break-in, particularly with engines that run a vacuum in the crankcase. 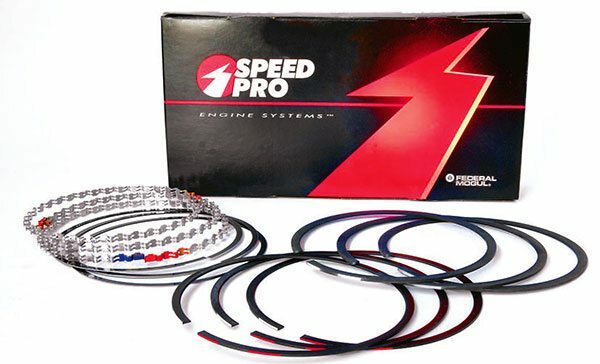 Speed Pro’s top-quality gas-nitrided HellFire series racing piston rings provide the essential combustion seal in the cylinders. These rings require much less special preparation than those of days gone by. Clearance checking, end gapping, and deburring are all that’s required. This small-bore, carbureted, small-block Chevy built for a roadster running at El Mirage incorporates large valve reliefs in the cylinder bores, high dome for compression, gas ports, fire slot, and highly polished surface. Looks nice, huh? Here’s the same El Mirage dry lakes roadster engine after a 175- mph spin in the dirt. The car snap spun so quickly the driver had no time to close the throttle, hence the immediate unavoidable trans¬fer of assorted lakebed material to all cylinders. One remedy is to perform the break-in with zero vacuum so the rings receive proper lubrica­tion during the initial seating pro­cess. If done correctly this often avoids the problem. Many builders fail to even recognize that micro-welding has occurred even though the engine may lose power and blow-by increases dramatically with a sig­nificant loss in crankcase vacuum. They often attribute it to something else and never really solve the prob­lem because they don’t examine the rings carefully upon disassembly. Hard anodizing the top ring groove helps prevent it unless ring groove machining is poorly done. Builders have hard anodized ring grooves for years and more recently they have employed coated rings and ring lands, typically with phosphate dry lubricant. Most manufacturers now offer top ring groove anodizing and specially coated rings specifically designed to combat micro-welding. All racing engines are susceptible to this problem and race piston manu­facturers have done their part by spe­cifically targeting the quality of their ring groove machining to achieve the smoothest possible surface finish with minimal peaks that can attach themselves to the rings. Engine builders look for it specifically upon teardown in order to take the neces­sary steps during assembly and initial fire-up to help prevent it. In addition to coatings, they often hand lap the rings to smooth the surface and they pay very close attention to ring clear­ance in the groove.